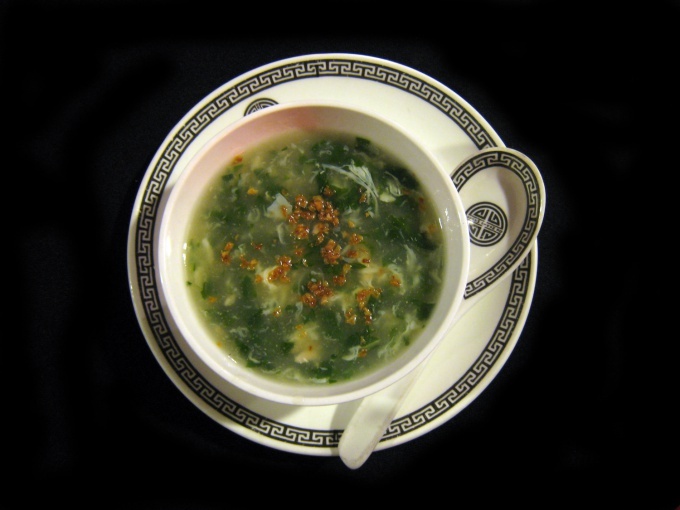 Green soup is called green, as it is usually prepared from the young grass. For the preparation of suitable rocket, spinach, nettle, sorrel, beet greens and even dandelion greens. Green soups very useful and contain a lot of vitamins. So they should definitely be included in the diet. How to cook green soup? Boil meat or chicken broth, strain it. Take a pound of greens, e.g., spinach and sorrel. Rinse them thoroughly under running water. Tear greens into small pieces with your hands. So you will leave more vitamins than when you cut steel with a knife. Peel two large carrots, cut into carrot sticks. Bring stock to a boil. Place the carrots, a few parsley roots, and simmer until the vegetables are soft. Chicken or meat from broth, separate from bone. Disassemble the meat into medium-sized pieces with the fibers. Dip into the broth. After 5 minutes, add to soup with spinach and sorrel. Simmer for 10 minutes. Pepper, salt soup to taste. Remove from heat. Green soup is ready. You can put in the feed to the plates on the half hard-boiled eggs and parsley leaves and dill. Serve the green soup can be both cold and hot. If you put in the green soup , several types of greens, the taste will only become richer. Moreover, almost all kinds of greenery are perfectly combined among themselves. Very good soup from nettles. He has a rich spicy taste. Before cooking the nettle pour over boiling water better, so it does not "bite". Green soupof spinach and thin, delicate taste. Usually it is prepared green soups-smoothie. A great soup is obtained from the arugula. The important thing is that the very rucola cooking is not even required. The recipe for this soupand simple. Blend 400 grams of arugula leaves, vegetable broth and 3-4 slices of white bread, soaked in milk. Squeeze in the resulting soup a few drops of olive oil and healthy vitamin the dish is ready! Those who cook green soup from the leaves of a dandelion – stock up on vitamins for the future. Dandelion contains many nutrients. To make it less bitter, boil the leaves several times with boiling water. Better to put in such a soup a few types of greens. If you cook green soup with beet leaves, know that you cook old Russian dish – beet soup. The taste of the soupand beet tops are slightly sweet and slightly sour. Beet leaves should be placed into the soup a bit earlier than the rest of the greens, as they are tougher and will cook a little longer. From what to cook green soup – you decide, but any of these soups good and tasty in its own way. Greens it is better to take young. Thoroughly rinse the greens under running water.